If you’re interested in taking shotgun shooting lessons in the Tampa, Florida, area, consider learning from Florida Sporting Clays. 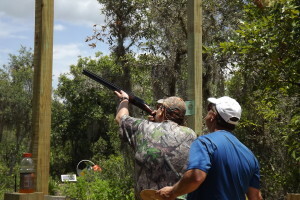 We’re dedicated to helping fellow Floridians up their scores on the sporting clays course and have a whole lot of fun while doing so. Instead of offering traditional shooting lessons, we take a different approach to shotgunning instruction. John Gangemi, founder and head shooting instructor at Florida Sporting Clays, is certified to teach the Coordinated Shooting Method Teach Recreational and Competition Shooting (CSM/TRACS) method, which was developed by legendary shooter John Higgins. CSM/TRACS focuses on teaching a shooting method rather than a specific technique for shooting, allowing you to learn in the manner that works best for you. And, this unique method will allow you to see specifically how and why you missed a target, letting you quickly self-correct for future pulls. For additional information about the sporting clays shooting lessons we offer in and around Tampa, FL, please contact Florida Sporting Clays today to inquire about instructor availability. We’ll be excited to hear from you and even more excited to help you increase your shotgunning skills.